Sailing more distance can get you there faster. Olympian Nick Adamson demonstrates the newest way to get downhill. I�ve been skiing for as long as I�ve been sailing. But I didn�t see the connection between the two sports until I stepped back into a Laser after a 15-year hiatus. Now I realize that powerful turns are required in both sports, and that a good turn often begins with a near-spill. In skiing, this tight-wire defiance of gravity is done to ride the mountain; in sailing it�s done to ride waves. The Laser regatta that opened my eyes began in a moderate sea breeze. I rounded the first mark in good shape, just ahead of a tight pack of five boats. The next leg was a broad reach on starboard, so being a seasoned, mature sailor, I stayed high after the rounding to protect my clear air on the long jibe. The gangly teenager who rounded a few boats behind had a different idea. He immediately rolled into a jibe and took off on port at a hot angle, reaching away from the rhumbline. That�s the last we�ll see of him, I thought. Wrong! The rest of our pack lined up on starboard, in nice, neat tactical formation. After reaching out of our peripheral vision, the kid then bore off sharply, sailing 30 degrees by the lee, �railed-up� in near-capsize. Riding the knife edge, he surfed a wave directly back through everyone�s dirty air, crossing inches in front of the pack. Oblivious to his gains and his new weathermost position, he carved a radical 60-degree turn up to reach away from us again, searching for yet another wave. This radical zigzagging continued the whole leg. He never jibed. He never looked back. He never pointed at the mark. He didn�t care about clear air or the old folks astern. And by the leeward mark, he was 100 yards ahead of everyone. I felt like Rip Van Winkle. Since that Laser regatta, I�ve been fortunate to have the opportunity to coach Nick Adamson, who won the U.S. Olympic Trials with downwind abilities that far exceed those of the gangly teenager. Before we look at his advanced skills, let�s examine some of the basic skills first. The first skill you need to master is sailing by the lee. To find out why, take a took at the illustration on the opposite page. But realize that mainsheet trim by the lee varies with the wind strength. In light air, it pays to ease the boom well past perpendicular. As the wind builds, the sheet should be eased less and less, and trimmed well aft of perpendicular in heavy air (over 15 knots). Overeasing the sheet in more wind will often cause a capsize. The second skill to master is knowing when to make wave riding the priority. In light air, or when the wind is offshore, waves travel slowly. You should ignore them and sail straight at the mark. As the windspeed or fetch increases, so does the speed of the waves. In most moderate, onshore breeze conditions the waves will be traveling faster than your flat water boatspeed. Then it will pay to zigzag, hunting, catching and riding waves. Don�t hunt unless you see something worth catching. Once the wind builds to the point where you are planing all the time, your speed can exceed that of the waves. Then your goal is to sail toward the mark as directly as possible, avoiding the steepest waves. When hunting for waves to ride in moderate air, speed makes the job easier. By reaching up as a wave approaches, you build the speed required to jump onto the wave face. When the wave lifts your transom, bear off to grab the ride. Don�t sail directly down the wave. If you can sail across the wave face like a surfer, you can attain higher speeds while still making the same progress dead downwind, toward the mark. That extra speed comes in handy when it�s time to turn off that wave and hunt for your next ride. In a boat with an unstayed rig, you can sail across the wave face two ways: on a reach or by the lee, as there are no shrouds to restrict how far you can ease the mainsheet. This two-directional ability gives you twice as much territory in which to hunt waves. The turn down to by the lee is called a top turn, because it is done at the top of a wave, as it lifts your transom. The turn up is called a bottom turn, because it is usually done just before you reach the trough of the wave you are riding. While most gangly teenagers are, by nature, tactically oblivious, there are some strategic principles involved in going fast while zigzagging. First, consider the wind strength. 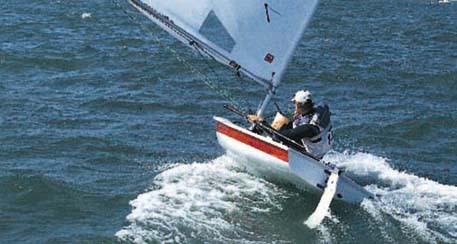 If it is out-of-control windy, approach the run as you would in a keelboat: get on the long jibe that takes you on a broad reach toward the leeward mark. Reaching provides you a wider choice of angles to avoid slow-moving waves. Sailing by the lee is too angle-critical; you�re likely to plow into a wave and capsize. However, in any other wind strength, do the opposite of what the sailing books say: Get on the lifted jibe. If you come into the weather mark in a left-hand shift, jibe onto port so you can be by the lee immediately, while pointing most directly at the mark. If you�re not sure which shift you�re on, don�t worry about it � you�ll go just about as fast whether you reach or sail by the lee. Pressure and waves are far more important. Clear air does matter, as better pressure always means better speed. But lateral freedom is just as important. In wave-riding conditions, you need to have at least 100 feet of space on either side of you, so your bottom and top turns can be made without restriction from other boats. So pick a course that gets you away from the crowd early. Finally, get out on the water and put in your practice time. Wave riding is a high-wire act. Like skiing, the only way to negotiate a mogul field is with perfect, fearless balance � with confidence born of many hours and countless capsizes. Ed Adams is Sailing World�s Senior Editor at Large, a past Laser national champion, and US Sailing Team coach. A loose vang allows the leech to pump automatically in chop. Every little pump propels the boat. It also throws a pressure vortex off the leech that circulates downwind and is recaptured as the boat sails across the wind. The leech provides a clean leading edge for attachment of leech-to-luff airflow at shallow angles past dead downwind. Watch the telltales. Heeling to weather raises the center of effort into stronger wind aloft. It also positions the effort over the boat for a more balanced helm, which reduces rudder drag. In light air, easing the boom past perpendicular boosts sheet pressure and feedback, as mechanical advantage is decreased. It also lays the sail forward when heeled to weather, so gravity works to keep the sail pressurized. Wetted surface is reduced when heeled to weather.